The Case Against Sugar is a journey through sugar history and science that argues the point that sugar is the principal cause of obesity, diabetes, coronary heart disease, and many other common noncommunicable diseases. This differs from the prevailing view in the research and public health communities that obesity and noncommunicable disease are multi-factorial, with refined sugar playing a role among other things like excess calorie intake, physical inactivity, cigarette smoking, alcohol and illegal drug use, and various other diet and lifestyle factors. I side with the latter view. Taubes argues that sugar is the only factor that reliably shows up when a culture develops Western noncommunicable diseases, supporting the point with examples of cultures that adopted sugar-rich diets and became ill. Yet he makes no effort to look for a counterexample that could refute his argument: a traditionally-living culture that has a high intake of sugar and does not suffer from Western noncommunicable diseases. If such a culture can be found, this piece of evidence is sufficient to reject Taubes’s argument that sugar reliably associates with the onset of these diseases in a population. Let’s do Taubes’s research for him. A well-studied Tanzanian hunter-gatherer tribe called the Hadza gets 15 percent of its average year-round calorie intake from honey, plus fruit sugar on top of it. This approximates US sugar intake, yet the Hadza do not exhibit obesity, cardiovascular disease, or any of the other disorders Taubes attributes to sugar. In fact, many hunter-gatherer groups relied heavily on honey historically, including the Mbuti of the Congo whose diet was up to 80 percent honey during the rainy season. Yet they do not exhibit obesity or insulin resistance. Taubes upbraids the research community for its belief that body fatness is determined by calorie intake, rather than the impact of foods on insulin. He supports the latter proposition with semi-anecdotal observations from Africa suggesting that a group of people eating a high-sugar diet supplying “as little as sixteen hundred calories per day” were sometimes obese and diabetic. A person who actually wants to get to the bottom of this question should conduct their investigation in a very different manner. The first order of business is to look up the relevant metabolic ward studies, which are the most tightly controlled diet studies available. These studies consistently show that calorie content is the only known food property that has a meaningful impact on body fatness. This is true across a wide range of carbohydrate-to-fat ratios and sugar intakes, and a correspondingly wide range of insulin levels. What makes Taubes’s oversight so extraordinary is that he was involved in funding one of these metabolic ward studies, which compared two diets that differed tenfold in sugar content. The results showed that a 25 percent sugar, high-carbohydrate diet caused slightly more body fat loss than a 2.5 percent, very-low-carbohydrate (ketogenic) diet of equal calories (18). Despite these clear and consistent findings, Taubes continues to insist that calorie intake is not an important determinant of body fatness, and he offers the reader questionable evidence in support of this while omitting high-quality evidence to the contrary. All while exuding righteous indignation about the scientific community’s misguided beliefs. Taubes argues that sugar is the only factor that reliably shows up when a culture develops Western noncommunicable diseases, supporting the point with examples of cultures that adopted sugar-rich diets and became ill. Yet he makes no effort to look for a counterexample that could refute his argument: a traditionally-living culture that has a high intake of sugar and does not suffer from Western noncommunicable diseases. If such a culture can be found, this piece of evidence is sufficient to reject Taubes’s argument that sugar reliably associates with the onset of these diseases in a population. Let’s do Taubes’s research for him. A well-studied Tanzanian hunter-gatherer tribe called the Hadza gets 15 percent of its average year-round calorie intake from honey, plus fruit sugar on top of it. This approximates US sugar intake, yet the Hadza do not exhibit obesity, cardiovascular disease, or any of the other disorders Taubes attributes to sugar. You have dozens of examples of populations switching to high sugar (note: switching) diets and developing diabetes and obesity – you have a few counterexamples of populations that have always subsisted on high sugar diets who don’t have chronic obesity, diabetes, etc. The very first thing that needs to be checked is what genetic adaptations these unusual populations have that allow them to eat high sugar diets and thrive. On the flip side, Taubes also doesn’t get to use Eskimo populations without someone investigating if they have adaptations to subsisting nearly exclusively on fatty seal meat. Being as fair as I can be, I think that probably honey and refined sugar are not the same thing, even if they have the same calories. Honey is an animal product while highly refined white sugar comes from either sugar cane or sugar beet. Raw honey, such as the Hadza (sp?) would be eating would have a lot of other things in it – right now, New Zealand manuka honey is being touted as the be-all and end-all. So I think an argument could be made that traditional societies that got their sweetener and energy boost from honey are not the same as modern societies that get a jolt from refined white sugar, and that we consume too much of the latter in all manner of forms we may not even realise we are consuming. As to the rest of it, though, on the face of it, it sounds as if sugar is Tabues’ hobby horse and he is not willing to dismount. Raw honey, such as the Hadza (sp?) would be eating would have a lot of other things in it – right now, New Zealand manuka honey is being touted as the be-all and end-all. Never has your anti-pun stance been made more clear than with this missed opportunity. I will be sad all day for this. Honey is about 80% sugars with the balance being almost entirely water, and of those it’s mainly fructose and glucose. It’s actually quite similar in terms of composition to high-fructose corn syrup (once implicated in American diets as a possible cause of obesity); the biggest difference is a higher fraction of maltose. Table sugar is almost pure sucrose, but your digestive system cracks that almost immediately into fructose and glucose. That’s… deeply weird, but I can’t tell from the abstract if it’s doing anything wrong. The related papers do seem to point in the same direction, though. But yeah, my point was that something that has been through the digestive tract of a bee is probably not going to be 100% identical with plant juices that have been boiled down and concentrated (well, at least if you’re making it using sugar beet, as in Ireland). They’re comparing it to pure glucose, not sucrose or HFCS. So not surprising at all. Well, that’s embarrassing. I even went on to read a bunch of glycemic index comparisons that put sucrose way lower than pure glucose, so I should have made the connection. “Normative biology”, to paraphrase Robert Nozick. Yep. And from listening to Taubs on a podcast, it’s pretty clear that when Taubes says “sugar” he means “refined sucrose”, whereas from these quotes Guyenet seems to think that Taubes means “any carbohydrate”. Taking a diet of honey and fruit and sprinkling refined sugar over it will make it unhealthy. So according to Taubes HFCS is totally fine? Sucrose is terrible but its metabolites fructose and glucose are totally fine? We keep bee hives in the south of the country (marvelous animals), and the wild honey is unlike sugar syrup with the provision that *it is not heated*. If your honey is milky and crystallized then it may be the real thing. When people buy honey for health reasons, they are wasting their time unless it is true wild honey. Which almost none of the shops have. Talk to your local beekeeper association! Honey is also very expensive generally and your local beekeepers would offer reasonable prices. I should also mention since there is no use-by-date for honey, it’s off the shelf storage for savings if our Euros become worthless. A family friend keeps beehives, so I’ve had the opportunity to look at quite a bit of honey in raw state. Its appearance varies substantially depending on… lots of stuff, really, but mainly whether it’s been filtered, the time of year it was harvested, and what the bees were eating. It does tend to crystallize, but mainly if it’s been sitting around in cold or temperate conditions for a while. Clear, liquid honey is not necessarily fake (though it is very likely to be filtered; pollen grains cloud most honey in the raw state); it may just be harvested recently, or you may happen to be in a hot climate. Beekeeper here. I make sure to avoid extracting cells of pollen or bee bread, it’s their only protein source and there’s no good substitute. Properly extracted honey shouldn’t have enough pollen to cloud. You’ll need a microscope to notice it (try it some time, pollen takes a fascinating variety of shapes!). If it’s been sitting around long enough, the pollen can act as nucleation sites for sugar crystals to form in suspension. Crystalliation is a much more common cause of turbidity than high pollen count. 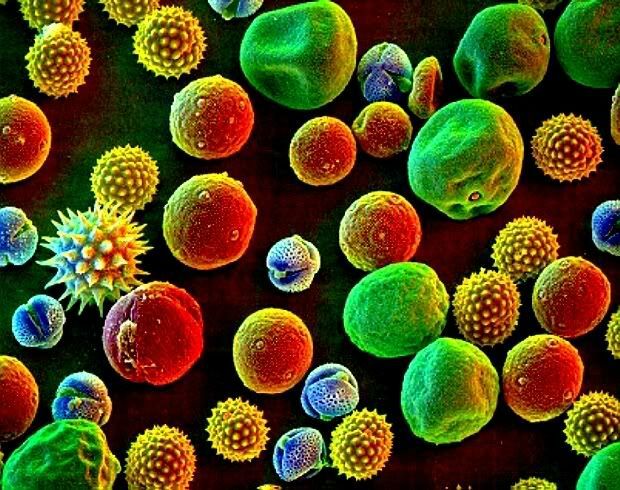 Yes, pollen is remarkable under the microscope. I was reading the other day that the pollens are part of the reason for honey’s medical attributes, at least for those with allergies. Much like the advice now given to parents on nut allergies, a small dose of honey/nuts (why not together!) in the diet makes it much less likely children develop allergies. This seems like a general heuristic. It reminds me of the earlier thread in which people advocated cleansing their vegetables e.g. to prevent E.coli. If you removed all incidence of soil from your diet, my intuition would be that you’d be sending less useful updates to your immune system. Same goes for too much water purity. If you drank only vapour distilled water there appears to be a consensus it would damage your health. There’s a fascinating video related to this subject called ‘Forest Bathing’. There appears to be strong evidence that walking in a forest has medicinal side affects (separated from merely exercising). Many geeks I believe, would be advantaged by having more plants in their immediate environment. It is funny that we look at India and China’s outdoor pollution problem as truly problematic because most of us spend our time in indoors environments and in close contact with natural human body and construction chemical ‘off-gassing’ products which aren’t good for us if they build up. If SSCers are interested, there’s a marvelous NASA study on which plants remove toxic elements from your immediate environment, they’re quite effective! In the past I don’t think this mattered that much but today we have houses which are much more air tight to reduce our heating/cooling bills. That implies we should be looking much more closely at indoor air pollution but it seems to be an ignored subject. tldr; Our fuzzy friends and green plants are net positive for your physical and mental health. The hippies weren’t wrong about that. Precisely – the emphasis should be on “switched to a heavy sugar diet”. If there’s a counterexample where that happened and obesity, diabetes, etc. didn’t follow then Taubes’ argument looks shaky. For a counter-example of a different kind there’s the Australian Paradox, where obesity continued to rise despite decreased sugar consumption. One thing that puzzles me with this kind of statistics is that while sugar intake (or similar dietary parameters, total calorie intake, etc) is measured as a population average, obesity is usually measured as the percentage of the population being obese. In other words we’re comparing an average to a quantile. Isn’t that a bit….unwholesome? The obvious argument is that if 50% of the population switches to diet soda, the other 50% can still be responsible for the 25% obesity epidemic. PS: In the Australian paradox study, they focus on added sugar. But if people switch from coke to orange or apple juice, that is just as bad when it comes to sugar. I don’t think people like the easy explanation, which is that Westerners over eat, rather than eating when we are truly hungry. If we stop eating sugar we’ll just replace it with something else because we love stuffing our faces. We need to learn to eat only when hungry, which is how I lost weight. Most Westerners don’t know what real hunger is and they eat in order to avoid feeling hungry, or even recreationally, rather than only eating when they are hungry. Of course, appetite adjusts like the strength of a muscle, so you need to ignore your appetite in order to get over the wall if you’ve managed to get really fat (much like you need to work really hard to get over certain fitness or strength walls and then the difficulty flattens out again). I think people are discouraged because they think it will be that difficult and tempting forever, but this is not so. From personal experience dieting, just eating less stuff is majorly majorly overlooked and seen as almost dangerous, but in reality people can go without food for quite some time. Again, Westerners have no idea whatsoever what true hunger is. People can survive being starved in camps until they become skeletons, yet cutting food consumption by 25% is some kind of dangerous activity that might leave you at risk of fainting spells and possibly suddenly kill you. We have a vested interest in not believing this because A: it’s not commercial enough for people selling diets, and B: it means that losing weight is difficult due to a lack of will power, and innate and out of your control or not, this makes people feel bad, so they look for other solutions. Anecdotes aren’t scientific data, but good old “stop eating fatty!” worked for me. A bit of exercise helps make it quicker too. I think people are discouraged because they think it will be that difficult and tempting forever, but this is not so. Thank you! I’ll definitely try again. How long did it take for you before it got easier? As an anecdotal evidence, this was my experience too. Of course, I am no longer fat, but I’m still neither fit because I still do not like the “bit of exercise” part. For me, change in my eating habits collided with a profound lifestyle change (going to college and moving to live on my own). As a student, the amount of money I have on hand is very limited but I insisted on buying simple foodstuffs I could could cook myself instead of “ready-meal” or fast-food style prepared stuff. And because of the “limited amount of money”, I started maintaining a excel sheet where I listed everything I buy, which contributed quite much how much attention I paid to what and how much different foods I’d pay for and eat. I’ve found that exercise leads to diet, and to more exercise. I started grappling (judo, now BJJ). This led to lifting weights and sometimes doing some supplemental conditioning. This led to eating better – because hauling extra fat around is tiring, and I wanted to compete at a reasonable weight class – and drinking less – because hangovers keep me from getting in the gym (alcohol is a huge source of calories, potentially – six beers can put a quarter-pound of fat on you). I never adopted fasting or anything, but I agree with the general principle. Only eat when you have to. This could be every couple hours if you’re doing some “eat 20-30g of protein every 2-3 hours” if you’re doing some bro science type diet. It could be less. I find that if I let myself I will eat when I’m not hungry, but bored. I’ve also found that willpower isn’t the main factor. Structure is. Someone with enough willpower to resist the siren song of eating a whole bag of Doritos 9/10 times will still eat more Doritos than someone with 1/10 willpower if the latter person doesn’t keep them in the house. I know you are being sarcastic, but about half a year. Like I said, dieting is hard! People quit or cheat all the time. Maybe there is a God, but it’s a Lovecraftian God screwing with us. I think some religions have suspected this for a while. This type of over-time confounding has a name in epidemiology — the “healthy worker survivor effect.” Robin’s seminar 1986 paper, which established lot of the modern causal inference stuff, used this issue as a motivation. I hate Taubes personally. About 6 years ago I was dating a girl who was overweight. She read Taubes’ book and basically went off the deep end diet-wise, leading directly to 2 years of a relationship dominated by her weird dieting beliefs. I would point at stuff like Guyenet’s blog (an actual obesity researcher) and other dietetics research but nothing could convince her that sugar wasn’t the devil. I had to break up with her over it. But did she lose weight? Is that necessarily Taubes’ fault? It seems to me, someone who goes off the deep end after reading a Diet Book Which Claims To Have All The Answers could just as well have latched on to raw veganism or something, and spent 2 years annoying you about meat and dairy being the devil, and Taubes’ book just happened to be the one she read at the wrong time. Oh believe me, if you are anyway chunky, you’ll get plenty of impetus. From your parents and school telling you about healthy diets and exercise, on upwards. “You’re such a lovely girl, if you only lost a few pounds!” Comments from strangers who feel entitled to tell you about your looks, your grocery shopping habits, and how looking at your fat fattiness makes them feel sick. Every doctor’s visit ending/beginning with “do you realise you are overweight” and then seguing into the lecture – speaking of where the girlfriend might have been steered to Taubes’ diet book, it could even be a doctor who recommended it (I got recommended to get a Popular Diet Craze of the time book by one doctor). A fat chick* – whether that’s a couple of pounds or a couple of stone overweight – who didn’t get advice, recommendations to join WeightWatchers/try this diet book it really works, and constant reminders of how you’re risking your health! would be a black swan. Get into your twenties/thirties and you’ll be a veteran of yo-yo dieting (crash diets, eat nothing but cucumbers** diets, burn the fat off exercise and diet diets) and having tried a few that failed to keep the weight off, you’ll be ripe for “This is real genuine science about how it’s sugar that screws up your metabolism” books. *I realise this applies to guys too. **Never actually seen this one, but there have been ‘eat only bananas so many times a week’ and ‘cabbage soup’ and other fad diets. Riiight, ’cause people are infinitely conditionable and never take independent action. I follow a 90% Taubian diet and have friends and relatives who are 100% Taubian, i.e. 25-50 grams of carbs a day and no sugar. As long as I don’t try to bore people with keto and low-carb lectures, I am pleased with how little the diet affects my social life. Nobody really notices if you don’t eat bread and skip the potatoes when you eat your entree, and many people these days refuse to eat desert, ice cream or candy. I don’t know why your girlfriend and you broke up, but it was something other than a low-carb diet. How can we be sure that John Arnold isn’t a time traveler? He seems to trade like he knows what happens and then mysteriously turned his fortune to save science from itself? The real question is, where is he keeping his time machine? If he’s a science-loving Biff Tannen, maybe in his garage? My educated, but not thoroughly educated, guess is that it is a combination of sugar and fat. Sugar spikes insulin, telling the body to store energy, and then the other calories get stored. I agree. Combine carb and protein, no problem; combine fat and protein, no problem; fat and carb = delicious self destruction. At least for me. In practice people also don’t eat a fixed amount of calories, like in a research ward. There’s some effect of different foods on how quickly and well satiety sets in. It’s complicated. There’s some effect of different foods on how quickly and well satiety sets in. Yeah, I find that the macro ratio affects the feeling of fullness in a qualitative way. Being full of carbs combined with fat (like from a pizza) is like taking a mild drug; A warm blanket over my body and mind. Being full of fat and protein without carbs on the other hand is merely a sensation in the stomach. So I don’t overeat when limiting carbs, because I’m not getting that extra mental comfort effect. That’s funny. Fat + protein, in concentrated form when I’m hungry, makes me pretty euphoric. Not sure how to describe it, but I just feel really, really GOOD. It’s almost as if we weren’t identical and interchangeable widgets! I know what you mean. If I eat a steak, with the fat left on, that’s about all I need. It just lights up all my satiation indicators, and wonder of wonders, I don’t feel full afterwards. I suspect that there may be something about the refining process involved as well, since obesity isn’t particularly common in Asia, as near as I can tell, where they eat tons of carbs– but non-refined carbs in the form of rice. That would apply similarly to honey. It’s fair for Guyenet to criticize Taubes, as a matter of scientific challenge, but he has a nasty “gotcha” kind of undertone which seems redolent of credentialism and narrowmindedness “because I’m an expert”. That sort of thing is why I am skeptical of Guyenet’s criticisms. My daughter is a type I diabetic so we have a lot of personal data on how different foods affect blood sugar levels and insulin needs. Pizza is really interesting stuff when it comes to blood sugar.Because it is carbs covered in fat the carbs are very slow to be digested. At first we would give my daughter the amount of insulin necessary for the carbs in the pizza immediately. She would then have a crash in her blood sugar as those carbs had not been digested yet. We would then give her juice or something to bring her back up, but then 4-8 hours later she would have a blood sugar spike when her body eventually worked through the fat and began digesting the carbs. Macaroni and cheese behaves similarly. I assume pizza behaves the same way as far as digestion for non diabetics and thus why it produces a different feeling from other foods. Glycemic index numbers generally assume that something is being eaten alone. A slice of white bread spikes blood sugar quickly. A slice of white bread with butter will digest more slowly, because of the fat in the butter. The “glycemic index” diet – which is a good diet – kind of tricks people into thinking “oh, I’m eating brown rice instead of white rice, it’s healthier, because glycemic index” when in fact what it’s doing is sneaking portion control in. Guyenet’s hypothesis, food reward, is basically that we are getting fatter because food tastes so good. This is probably true, but has somewhat depressing implications. Edit: Maybe it’s only certain types of good tasting that over-ride satiety signals? Spices are fine, but fat or sweets trigger the eat-more response. I think hyperpalatable foods are a big part of it, but there were hyperpalatable foods in the 50s and 60s. I don’t know if it’s essentially saying the same thing, but a lot more people can afford a lot more hyperpalatable food than they could 50 years ago. When I was a kid in the 80s, going out to eat was a rare luxury and my dad was an engineer so we were solidly middle class. Now everyone goes out to eat all the time. Alas, no. Or rather, he seems to treat it as more of a continuum – at Level 2 he tells you to stop adding sugar/sweeteners to your food, if Level 2 doesn’t work you can move up to Level 3 and stop adding fats (you can still eat fat on its own, just don’t add it to your food because food reward) and if THAT doesn’t work you can go super-ultra-self-denial with Level 4 and stop adding seasonings. No herbs, no spices, not even salt – though as with fat you can consume salt on its own if you feel you need it. This is supposedly “approximating the reward value of certain non-industrial diets”, though I really have to wonder what kind of godawful backwater you’d have to have gone to, in any time period, to find a people whose normal cuisine includes no herbs or spices of any kind. I really have to wonder what kind of godawful backwater you’d have to have gone to, in any time period, to find a people whose normal cuisine includes no herbs or spices of any kind. I have it on excellent authority that parsley, sage, rosemary, and thyme were all well known in pre-industrial England. 1966 is not “pre-industrial”. The lyrics say nothing about those things being available at the Fair; and since it references a “cambric shirt with no seams nor needlework” among other impossibilities, I think we have a somewhat unreliable narrator anyway. Common herbs such as sage, mustard, and parsley were grown and used in cooking all over Europe, as were caraway, mint, dill and fennel. Many of these plants grew throughout all of Europe or were cultivated in gardens, and were a cheaper alternative to exotic spices. Mustard was particularly popular with meat products and was described by Hildegard of Bingen (1098–1179) as poor man’s food. While locally grown herbs were less prestigious than spices, they were still used in upper-class food, but were then usually less prominent or included merely as coloring. Anise was used to flavor fish and chicken dishes, and its seeds were served as sugar-coated comfits. Believe it or not, pre-industrial Europe wasn’t a stark wasteland, plundered of all available natural resources. While spices and herbs were a big motivator to go abroad, they did have the basic resources to make good food – if they did not have mustard or mint they would have started calling tree bark a herb, so that they might have more variety. “Scarborough Fair” far predates Simon and Garfunkel. Time to add another quote to my “this is SSC so I can’t tell if they’re joking” pile. In case you weren’t pulling our legs, the song is specifically about a man who asks his former lover to perform a series of impossible tasks for him, and if she does, he’ll take her back. Lightly googling for the Kingston Trio, I found lots of sites crediting Garfunkel for popularizing SF, after he learned it from a more serious source — from whom the line stretched back into British days of yore. Btw, is Friedman okay? Shouldn’t he be along crediting Medieval Arabs with introducing the Medieval song, the recipes, and the seeds and/or roots of the plants. As it happens, I’m getting ready for a medieval cooking workshop we are doing in our house tomorrow. Largely Islamic recipes, but I may see if there is anything in Martino I want someone to try. The Islamic sources are better than the European sources before about the 14th century, but I don’t know if that reflects the cuisine or only what written recipes have survived. We have evidence of spicing in European cooking back to Anglo-Saxon times, but no recipes that early (other than the Roman sources, which of course uses spices), unfortunately. Nybbler, I have to think you are being mischievous. That kind of absolutely plain and scanty diet would usually have been for religious fasting purposes, and outside of those seasons and times, people did have flavouring to their food. Maybe spices like pepper were not known in pre-industrial (which admittedly may not be the same thing as non-industrial) England and Denmark but certainly herbs were known and used. Ramsons or wild garlic, for one, is a plant that is growing in the hedgerows here and can be used for flavour. Nettles (young green nettles, the fresh growth, made into a soup as a ‘blood cleanser’ and general tonic). Seaweed will give you salt – dillisk (which my father used to eat as a boy, picked off the local beach and allowed to sun-dry until crisp), and you can use Carrageen moss to make a pudding (it’s often used as a food ingredient as an alternative to animal gelatine). Hedgerow fruits – blackberries, hips and haws (rosehip syrup was a source of vitamin C before anyone ever knew what a vitamin was, and as the proverb says “when all fruit fails, welcome haws”). Sloes which are really too tart to eat as fresh fruit but can be preserved in various ways. Elder tree that gives elderflowers for cordial and elderberries for jam! I can’t speak to Ireland, since, so far as I know, no medieval Irish recipes have survived. But pepper is a common ingredient in medieval English, French, and Italian cookbooks back to the 14th century. But pepper is a common ingredient in medieval English, French, and Italian cookbooks back to the 14th century. Yes, if you want to go “non-industrial diets were fibrous and bland” you have to go pretty far back. I imagine once people started figuring out cooking with fire, and then “you don’t have to burn it over the flames, you can put it in clay pots and still cook it”, that “if you put this green stuff with the meat, it tastes even better!” wasn’t too far behind. Cloves are the fruit, whose taste is rare. There’s no lack of cubebs there. The best-dressed geese a man could see. Sprinkled with cloves and cinnamon. Mischievous, me? Surely I would not jape at common stereotypes of English food, such as “boiled mystery meat, along with boiled vegetables (not too fresh), washed down with warm, flat beer”. I am far too serious to do such a thing. As for Denmark, I was there for work once, and our hosts brought us to several definitely non-Danish restaurants. So naturally someone asked them about Danish food, and the response was “Yah, nobody eats that, it’s very bland and boring”. The real fun of medieval cookbooks is that they were a bunch of notes to explain how to do one particular dish, on the assumption that the person was already a practiced cook. I have some books of medieval recipes, which always include the translation into modern style recipes. Of course, the reduction in smoking is a real factor in rising obesity. It’s an long and easily identifiable effect to watch happen to people as they quit. Do we have studies of smoking prevalence vs obesity in different countries over time? I know the Chinese still smoke like it’s going out of fashion. Also interesting to control for as perfectly possible that addictive, ‘treat’/reward inclined or pleasure-seeking personalities will find SOMETHING to enjoy and that cigarettes and cupcakes crowd themselves out. Thinking about it, this might be an argument against my plan to cut out caffeine as not sure how much more harmless a habit I can find that is a convincing treat/pleasure/crutch. Early twentieth century advertisements for cigarettes frequently and specifically mentioned weight loss as a reason to start smoking. Another factor is reporting; my great grandmother was, by all accounts, quite obese, but I doubt a rural farmer’s wife got counted by anybody. You used to be able to buy dexatrim OTC in the impulse-buy shelves of the grocery store, and I used to be able to get various effective metabolism boosters in my workout shakes only 15 years. The current regime of regulating this stuff is not an improvement. Looking through the other end of the telescope, Taubes’ theory predicts that groups that eat diets low in sugar will not be obese. Obesity is a concern in the Inuit, as in many other groups, and data from the International Obesity Task Force have indicated that Inuit men are in the top half of nearly 80 countries and territories in the extent of overweight and obesity (1). The position is worse for Inuit women in that they rank on these measures in the top quintile of over 100 coun- tries/territories (1) . Maybe his theories were more plausible in the early 90s, but yeah, it doesn’t seem like there’s much left to say about them. Based on stuff in Canadian news media about the far north of Canada, they aren’t eating a traditional “nothing but walruses” diet. I can’t check your link, because it’s broken, but every now and then left-leaning Canadian news sources will do articles about how the people in the far north (for reference, Nunavut is over 4/5 Inuit, and is pretty much the most northern part of Canada) have an unhealthy diet composed heavily of processed foods which are exhorbitantly expensive due to being shipped long distances. As a result of changing environments, displacement, hunting and fishing costs or restrictions, and a loss of harvesting capabilities, fewer individuals now consume traditional foods, and physical activity has declined among the Aboriginal populations. Traditional First Nations, Inuit and Métis diets are based on a combination of foods which includes fish, shellfish, marine and land mammals, and game birds, as well as green and root vegetables, fruit and berries — food sources that provide a protective effect from diabetes. Today, most First Nations individuals, Inuit and Métis consume more high-sugar, high-fat, store-bought (processed) foods than traditionally gathered foods in their daily diet. That’s from a much larger official report on diabetes in Canada. Type 2 diabetes was rare among the Inuit prior to the middle of the 20th century, and now they get diabetes at a rate comparable to the general population. So yeah, poor health among Inuit nowadays really doesn’t say much about the health effects of their traditional diet. If the causality between sugar and obesity was linear, even if the Inuit eat slightly less sugar you would expect them to be less obese. Though I admit I don’t know that this is the case. The reduced physical activity due to not having to hunt/gather the food themselves probably plays a role. While genetic factors are important in the epidemic of type 2 diabetes among Indigenous peoples (26), its rapid appearance over a few decades in genetically diverse populations is likely the result of an interaction of local genetic mutations with numerous social stressors and lifestyle factors (27–32). Recent research suggests that epigenetic factors play a key role in the interaction between genes and the environment, influencing the development of diabetes complications (33,34). Inequities in the social determinants of health brought about through colonization (14) contribute to the main risk factors for type 2 diabetes in Aboriginal peoples, such as decreased rates of physical activity, stress, dietary acculturation and an unhealthy diet, food insecurity, obesity/metabolic syndrome, and high rates of diabetes during pregnancy. I remember reading/hearing something to the extent that a higher rate of diabetes may have to do with populations more adapted to “feast or famine” conditions than populations which had settled agricultural lifestyles for thousands of years, but that is hardly a source. But there is a lot of different stuff going on. Poverty certainly plays a role. Indigenous-descended peoples in Canada tend to live in fairly remote areas – so away from health care resources – and tend to distrust the government and Canadian society at large – for damn good reason I might add. My 12-year-old son loves candy and soda. I’m personally very anti-sugar. How reasonable is it for me to attempt to greatly limit his consumption of sugar-rich junk foods? Very reasonable. It’s the job of the parent to guide children away from dangerous habits which will have long-term repercussions while the children are not developed enough yet to make rational decisions themselves. The research on obesity set points indicates that once certain thresholds are reached it becomes nearly impossible to come back down from them. Reasonable to attempt to get him to switch to something healthier but not to cut it out completely. If he’s twelve, apart from anything else he’s still growing and all that sugar is probably being used for energy. If you are very unreasonable and ban everything, since you can’t control his every waking moment (what about when he’s in school?) then he’ll find some way of still getting junk and he’ll resent your actions too much to take in the good advice. The problem is that things that seem healthier (like fruit juice) are just as full of sugar as soda, so that merely switching from soda to juice isn’t enough. Let him have treats but don’t let him consume junk instead of a proper meal (e.g. he doesn’t want to eat supper because he’s been snacking on junk all the evening), is about the only advice I can give. It is very reasonable. I agree with ben and Deiseach. Another suggestion I’d add is to not allow sugar in your house. That way, you don’t have to police him all the time (who could take cake away from a child at a birthday party? ), but whenever he’s home and hungry, he has to have something healthy as there are no other options. This will still help him develop healthy habits too. That is the way to do it. Just don’t stock up on candy and soda, but don’t sweat the other stuff. I agree with Deiseach. If you cut it out completely it’ll become the forbidden fruit, and he’ll probably latch onto that as a way of revolting against you. He’ll also take the message that it’s okay to micromanage your kids’ lives. I would bet it would result in more damage than good. You’re his parent. It’s completely reasonable assuming you believe it is harmful or potentially harmful to him. I think in this context reasonable meant “would this achieve my goals”, not “do I have the right to do this”. Not how I read it! Given a 12 year old I thought it was a ‘I think it would contribute to goals but also is quite controlling, is the compulsion justified by the benefit’. There’s more to life than weight gain. My young cousin has a mouthful of silver from Grandparents indulging a sweet-tooth. One approach to reducing sugar I’ve tried is to mix one part juice to two part water. Buy some juice that he likes and pre-mix it with twice as much water in a jug or similar container. Leave that in the fridge as the only sweet drink. If he drinks it often enough, he may become accustomed to a lower sugar content and he might start finding regular soda to be a little too sweet. Just an idea, no money back if it doesn’t work or backfires horribly. He probably would love THC, MDMA, & nicotine too, if it was available for him out of vending machine in easily consumed format for a a dollar a dose. The difference is in degree, not kind. This is just from reading lots of anecdotes, but it looks as though forbidding sugar leads to bingeing. I’m not sure what reasonable access to sugar is. One or two desserts/day, but not as a constant snack, maybe? I think modern snacking habits are what is really responsible, and I notice (all this is simply observation from what I see out on the streets, so it’s not anywhere near data) that there does seem to be a habit of giving kids something to stuff in their mouth to keep them quiet and not crying – constantly they’re snacking on something like those sugary cereals or lollipops or the likes. This is definitely not how it was in my day, because (a) the range of snack and junk was simply not there (b) our parents didn’t have the money to spend on it (c) it would have been unthinkable, for instance, to give a child a mini-box of cereal to eat at Mass to keep them quiet. All this is much different nowadays. Eating and drinking on the streets was, in my time (yeah, this is “you kids get off my lawn” talk, I know) considered to be rudeness and a sign of ‘bad rearing’. Nowadays everyone eats on the go, partly because they’re rushing to work or haven’t the time to eat during the day. Same with eating and drinking in classrooms/offices (part of that is the necessity of eating lunch at your desk, which may be great for productivity if you’ve got a sandwich in one hand while answering a customer’s phone call with the other, but can’t be good for health). Starbucks seems to default to skim milk. Obviously I’m not typical, but I’ve tried their Frappuchino– it tastes great but makes me feel like crap. I assume it’s the combination of caffeine and lack of fat. Sugar doesn’t usually make me feel that bad. I read Good Calories, Bad Calories and came to the conclusion that a) Taubes is right that too many refined carbs are bad, and certainly my personal experience suggests that cutting carbs is the easiest way to lose weight, and b) his proposed mechanism for how that seems … contrary to reality, to say the least. In my view, it’s entirely psychological, and often idiosyncratic – carbs, especially refined carbs, make me want more more more to a greater extent than protein or fats. EDIT: My view is, to be clear, based largely on anecdata and bro science. Aren’t equal calorie studies only half the picture? Could high sugar foods simply be a factor in high calorie consumption? Guyenet’s review is pretty weak itself. He falls back on correlational studies to make his case, which is a sin that Taubes rightly criticizes. The truth is that Occam’s Razor is a weak argument that only applies when two hypotheses are equally well supported (or equally unsupported). This is also known as “Einstein’s Razor”: “It can scarcely be denied that the supreme goal of all theory is to make the irreducible basic elements as simple and as few as possible without having to surrender the adequate representation of a single datum of experience.” In other words, make your theory as simple as you can, but no simpler. Each of these is logically indisputable. Yet you have no idea how many times I get into arguments because someone is conveniently ignoring one or more of these. Comparing groups with vastly different evolutionary histories, lifestyles and hence dietary adaptations is going to be foolhardy. What the Hadza do has limited baring on what a group long adapted to agriculture do, like modern White Americans. The only thing Guyenet has got going are his metabolic ward studies. They make the point a lot better than all the rest of the stuff he’s written. In the end, we know little about what causes obesity and what does not. The biggest problem is that virtually every idea put forward is impossible to properly test. Uncontrolled correlational studies do not count as evidence. Even if we can show a certain aspect of dietary composition leads to weight loss in the already obese, that doesn’t tell you much about what causes the obesity in first place (and by this, I mean the change over time; obvious genes are a major cause of variation in obesity within a time period). What the Hadza do has limited bearing on what a group long adapted to agriculture do, like modern White Americans. Yes, rather like doing an alcoholism study on American Indians and then applying its results casually to people of European descent. Tell me about it. Like the new recommended blood pressure limits (now we’re supposed to aim for under 120/80) which, I read with my jaw dropping, were set from results of studies on Brazilian Amazonian tribespeople. The explanation was contained in the quote. Virtually every claim made about health and lifestyle drawn from observational studies have been found not to hold when examined by more rigorous methods (e.g., RCTs). So yes, it is quite fair to say they don’t count as evidence. I’m certainly nobody to listen to for diet advice, but my impression is that modern diet thinking too often assumes that to be “scientific,” the advice must apply universally to all humans. In reality, there is a lot of human biodiversity about how we each deal with various nutrients, both between ancestral groups and even within ancestral groups. Consider alcohol, a substance that our ancestors came in contact with in different eras. For example, if you are Italian, a glass of wine with dinner is probably not very bad for you. Your ancestors evolved to deal with wine over the last 10,000 years or so. If, however, you are an American Indian, whose ancestors might have only a few centuries experience with alcohol, it’s probably more prudent to be a teetotaler. You should also pay close attention to your relatives’ experiences with alcohol. For example, the President, a northern European, is a teetotaler because one of his siblings was ravaged by alcoholism. Probably something more or less similar is true regarding sugar. So one suggestion would be to search out diet advice from your relatives who have successfully dieted. Then try different diets and see which works for you. There’s a considerably less extreme argument against sugar. If you happen to find yourself a member of a western society living a western lifestyle, as a practical matter cutting down on your sugar intake will help you lose weight, while other diets will be impractical to follow, or only help you to the extent that they implicitly include soda and juice from your diet. Not to say that a low-calorie diet which includes lots of sugar might also work for you, but as a practical matter that’s very hard to make happen. Wanting to lose 15 pounds, I tried a low fat (and thus high carb) diet in the early 1990s and gained 25 pounds. Then I switched to high fat and low carb and lost the 25 pounds I’d gained rather easily. I still haven’t lost the original 15 pounds I wanted to lose. If anyone’s looking for a source of rigorous nutrition advice, I highly recommend Alan Aragon. He writes a research review for subscribers, and his general articles for the lay public are excellent for those who don’t want to get too far into the weeds. Aragon’s particular area of expertise is sports nutrition, but many of the underlying principles are just as relevant to the general population. I’ve used his writing to inform my own habits. For example, I did a self-experiment/stunt recently in which I ate 222 large pizzas in a row, while improving both my body composition (lower bodyfat percentage, more muscle) and my lipid profile (three out of four indicators improved). Aragon actually debated Taubes a year or two ago, and absolutely trounced him. To Taubes’ credit, he admitted as much during a Joe Rogan interview just the other day. I listened from 1:58 to 2:02, and I wouldn’t described what Taubes said as admitting to being “trounced.” He did admit that he lost the debate, but claimed it was because the audience was “100%” on Aragon’s side to begin with. I love Joe Rogan’s podcast, but I actually skipped the Taubes episode because I knew from reading SSC that his work is a mixed bag. When it comes to nutrition and health, Joe tends to have a lot of guests with fairly unorthodox views that are not well supported by the latest science. Dr. Rhonda Patrick is another guest I’m very suspicious of. She seems convincing because she’s very intelligent and knowledgeable, but she tends to extrapolate her knowledge of basic research into remarkable claims that sound too good to be true and are not supported by any clinical data. For instance, her support for cryotherapy seems to have no scientific basis. Sorry, you’re right. I should have said ‘admitted he lost the debate’. Agree with the varying quality of podcast guests too. I wish people like Rogan vetted their interview subjects more carefully, because the average listener will struggle to tell the difference between a genuine expert and a convincing-sounding hack. Unless I’m missing something, the conservation of energy dictates that this must be true. I think you’re missing something. Calories aren’t necessarily absorbed by the human body in the passage of food through its system. I believe “calorie content” in foods is based on calories absorbed. Changing food so fewer calories are absorbed without nasty side effects turns out to be difficult. That implies that calories absorbed is always the same regardless of what else you’re eating at the same time (except the extreme case used for Atkins). Seems unlikely, especially given there’s often differences in how you cook things. If the claim is true then it’s helpful in principle because if you actually control calories rigorously you should have understandable results. Of course, what diet is best goes back to satiation, ability to maintain it etc. I supposed technically the calories from a 330 ml can of soda and from seventeen ounces of raw turnips are the same, but they sure feel different. While you’re strictly correct, applying conservation of energy to an extremely complex biological system like the human body kind of simplifies it to a point where it renders it a totally useless statement. Genetics, different effects of different food types and a lot of psychological/lifestyle factors mean that a statement like ‘calories in = calories out’ is really pretty useless for public health even if it is strictly true. 1. Potatoes significantly change there ability to be digested when cooked. (for most people raw potatoes are non-digestible fibre but when cooked they become carbohydrates – although this can vary between people). 2. The digestible calories in nuts depends on the amount you chew them (or more specifically the sizes of chunks you leave – but in this case people seem to be fairly consistent in their chewing). 3. There are a few case reports that suggest some people are able to digest Psyllium husk – normally a fibre for most people. 5. Protein has a satiating effect – depending on how the study was done this could change how much food people choose to eat. 6. exercise has the effect of increasing rest-time when not exercising, this counteracts some of the calorie loss during exercise). 1. The digestible calorie content can vary between individuals. 3. If the study lists foods you can and cant eat as a way to change diet, the mechanism might not be through a different in calories it might be through satiating effect, stimulant effects, etc. 1. Calories we absorb is not the same to calories measured in a bomb calorimeter. 2. The food we eat might change our exertion/lethargy causing a change in net calories. Other than that, yes ? Because ultimately, people can’t absorb more calories than are present, so the upper limit is pretty important if you don’t know in what specific way your individual body will differ in its ability to absorb those calories. It will always be somewhere below the full energy content, so if the calorie number is set, then people should lose, to varying degrees, more than you’d expect based off that number. That sounds about right. Yeah, calorie absorption of certain foods can vary between people, but that’s pretty meaningless given that you can’t perfectly determine your TDEE (total daily energy expenditure) anyway. Just starting with an estimate of calories in and out and adjusting either estimate based on your gaining or losing weight seems like a reasonable and practical way to go. Finding the least uncomfortable way of eating may require some experimentation – some people like low or high carb diets, some people like more or less frequent meals, some people like to eat more filling foods or less calorie-dense foods – but it’s not that complicated to get a moderately sustainable diet going. I lost about 40lb by just keeping a food budget in Myfitnesspal and while it wasn’t fun, it worked pretty well. Outside of blogs like this one, it still looks like the 90s to me. The shops are still full of low fat foods branded as healthy, with the fat usually replaced with sugar. The actual NHS is still recommending people switch from butter to margarine and from whole milk to skimmed. The shops are still full of low fat foods branded as healthy, with the fat usually replaced with sugar. The actual NHS is still recommending people switch from butter to margarine and from whole milk to skimmed. Another factor: who can doubt cui bono among the vendors? Skim milk doesn’t have to masquerade, it’s proudly fat-free. Remove its oil to make canned fish healthier; but when the next study reverses that, keep removing the oil and sell it separately as a fish oil supplement. The oil fish is canned in tends to be canola, olive, or other vegetable oils, not the oils containing the omega-3 fats. I looked in the pantry and tuna canned in water contains very little omega-3s, and salmon canned in water a little more, but both are leaner cuts of the fish – tuna especially is sold as low-fat. However, herring and sardines in water both contain as much omega-3s as a few fish oil pills. Remove its oil to make canned fish healthier; but when the next study reverses that, keep removing the oil and sell it separately as a fish oil supplement. I imagine the worst canning element was the brine, because that would load up on your salt; fish in oil or in plain water would be better from that point of view. Thanks for pointing to this. Guyenet did a good direct rebuttal of Taubes elsewhere recently, too. Unlike yourself, I don’t believe that Taubes ever had anything useful to say. Refined carbohydrates and added sugars have been intensely criticised by researchers for decades. In fact, as Guyenet shows in the Cato rebuttal, even in the 1980 dietary guidelines sugar was singled out as being just as bad as “fat”. And, even on the misguided low-fat advice, Walter Willett and the Harvard School of Public Health have been criticising this advice since the late 1980s, so just a decade or so after the advice was given in the first place. Taubes was and is simply providing us with this message, but a lot of irresponsible messaging in addition when it comes to sugar and obesity, and also when it comes to saturated fats. Many health authorities seem to be in the best place they’ve been in for decades. The Harvard School of Public Health, the American Heart Association and others recommend replacing saturated fats with monounsaturated and polyunsaturated fats found in olive/canola/flaxseed oil, nuts, seeds and oily fish, in line with evidence from RCTs and prospective cohort studies which look at what saturated fat is replaced with. That said, some still adhere to the irresponsible low-fat message, which demonizes all fats including healthy unsaturated ones, including the NHS as another commenter pointed out. What is the evidence for maligning saturated fat? To add to all of that, we’ve had more recent data which haven’t yet been included in systematic reviews and meta-analyses. Two studies pooling the data of two large prospective cohort studies, published in 2015 and 2016 respectively, find that replacing saturated fats with monounsaturated and polyunsaturated fats, and whole-grains, is beneficial for health, and that replacing animal protein with plant protein reduces all-cause mortality. the evidence from epidemiologic, clinical, and mechanistic studies is consistent in finding that the risk of CHD is reduced when SFAs are replaced with polyunsaturated fatty acids (PUFAs). The evidence is crystal-clear that a Mediterranean Diet, rich in fruits, vegetables, whole-grains, healthy plant proteins (legumes/beans), and monounsaturated and polyunsaturated fats found in olive oil, canola oil, flaxseed oil and nuts, seeds and oily fish is best for long-term health. It allows for moderate consumption of tea, coffee, alcohol, and dark chocolate, and only restricts refined carbohydrates and added sugars, being naturally low in saturated fat. We now have two gold-standard randomized control trials demonstrating that a Mediterranean Diet rich in the foods above substantially reduces the risk of cardiovascular disease and possibly all-cause mortality, with one of them producing some of the greatest reductions in risk I’ve ever seen in real life. The 2013 New England Journal of Medicine one probably underestimated the benefits of a Mediterranean Diet, too, because the control diet was also a Mediterranean Diet, but was significantly lower in extra virgin olive oil and nuts, and slightly lower in legumes. I agree that focusing on saturated fat alone without noting what it should be replaced with is a bad idea, because most people will replace it with refined carbohydrates and added sugar, which are probably worse for the cardiovascular system. Thanks for all the info. Looks like I have some reading to do. You started by looking at four meta-analyses on saturated fat consumption. But if I were going to pick four meta-analyses to look at, I would simply look at the four most recently-published ones, rather than cherry picking. Of these most recent four, none of them found a link between all-cause or cardiovascular mortality and saturated fat consumption. One of four found a link between saturated fat and number of cardiovascular events (although not mortality). Next, you mention RCTs. If we’re debating the substitution of saturated animal fats for polyunsaturated vegetable oils, I’d prefer to look at RCTs that make only that substitution — not trials of the “Mediterranean diet” which are confounded with other potentially-beneficial dietary changes (increasing consumption of fruits, vegetables, fish, etc.). In 5 of 6, all-cause mortality was increased by substituting polyunsaturated vegetable oils for saturated animal fats. And the remaining 1, the reverse pattern held, but statistical significance was not reached. Edit: I think I mistakenly overstated my support for Eric’s post. One has to be very careful about which studies to select obviously, and Eric’s list is misrepresenting the literature. My intention was not to cherry-pick, but to list all RCTs which investigated the effects of saturated fats versus polyunsaturated vegetable oils on all-cause mortality. If I missed any, it was a mistake — please let me know! That’s why those trials were not in my list. Why mine weren’t in their list I don’t know. “Fifteen comparisons, including 13,004 participants and published between 1965 and 2007, compared a modified fat diet with control or usual diet (Frenkiel 1986 , Houtsmuller 1979, Sarkkinen Fat Mod 1995, Dullaart 1992 , Rose 1965 , Minnesota Coron men 1989 , Minnesota Coron women1989 , MRC 1968 , Due Mod fat 2008 , NDHS Faribault 1968 , NDHS Open 1st mod 1968 , NDHS Open 2nd Mod 1968 , Oslo Diet-Heart 1966 , Sydney Diet-Heart 1978 , Veterans Admin 1969 ). Christakis et al. (1966) was excluded, and this was before Ramsden et al. (2013). The conclusion on p. 32 : Does a long term modified fat diet, compared with usual diet, reduce mortality, cardiovascular mortality or cardiovascular morbidity (or individual health events such as myocardial infarction, stroke, diabetes or cancer)? • There were no clear effects of modified fat diets on total or cardiovascular mortality, despite the inclusion of over 13000 participants in studies of over six months. • There was a suggestion (but without statistical significance) that modified fat diets reduced cardiovascular events by 18% (RR 0.82, 95%CI 0.66 to 1.02, p effect 0.07, 11,660 participants, I2 61%). Hooper et al include two polyunsaturated substitution studies that I did not (the Oslo Diet-Heart study, and the National Diet-Heart Study). After extensive searching, I couldn’t find the full text of the National Diet-Heart Study anywhere. So I can’t confirm that, for them, “polyunsaturated fat” = “polyunsaturated vegetable oils” (as opposed to fish oils); and I also cannot confirm that “saturated fat” = “saturated animal fats” (as opposed to hydrogenated vegetable oils, which would contain ample quantities of trans fat). Let me know if you have any luck finding the full text — I’d be very curious to see it! So it looks like the complete list of RCTs would be either the 6 listed above, or the 6 I listed above plus the National Diet-Heart Study (depending on whether or not the National Diet-Heart Study used vegetable oils as the polyunsaturated fat + animal fats as the saturated fats). Hi Eric, thanks for your detailed reply. I specifically included meta-analyses which looked at what the saturated fat is replaced with, and the fourth one that you cite does not look at what the saturated fat is replaced with. The first one that you cite, the 2016 BMJ OpenHeart analysis, is interesting, although its lead author, Zoe Harcombe, has a conflict of interest given that she sells diet books and has a business to do specifically with the diet that she recommends. That’s not to dismiss it out of hand, but I’m much more inclined to put more weight on the Cochrane review and the 2010 meta-analysis. Lifestyle advice to all those at risk of cardiovascular disease and to lower risk population groups, should continue to include permanent reduction of dietary saturated fat and partial replacement by unsaturates. As for the third: the re-evaluation of the Minnesota Coronary Experiment, that study had serious flaws beyond the control of the investigators. The amount of Omega-6 PUFA used in the experiment was way above what the AHA recommends and what most Americans eat, and to each these levels they created fake milk and cheese and a special corn oil margarine for the unsaturated fat group, except this margarine contained trans fats, which is why the results were as they were. 75% of the participants were lost in the first year. The main results of this experiment were described in a paper in 1989, and the “recovered” data adds nothing new: the causes of death in the paper were unknown. Also worth noting that the authors of this re-evaluation did do a meta-analysis of RCTs in 2013 which found that replacing saturated fats with vegetable oils, as long as they had some of the Omega-3 ALA in them, did produce a benefit. The same is true of replacing saturated fat with a mix of unsaturated fats including Omega-3 DHA and EPA, as you allude to when you discuss the Oslo study. So, when it comes to RCTs, we have a 2016 meta-analysis by Hooper and colleagues, a 2015 Cochrane meta-analysis, a 2013 meta-analysis by Ramsden and colleagues and a 2010 meta-analysis by Mozaffarian and colleagues all in agreement that, at the very least, replacing saturated fats with polyunsaturated fats, as long as plant and/or marine sources of Omega-3 PUFAs in particular are increased, is beneficial. We also have systematic reviews and meta-analyses of prospective cohort studies which find that replacing saturated fats with polyunsaturated fats is beneficial, as noted in my first post. The ability of prospective cohort studies to distinguish between plant sources of Omega-3 (ALA) and Omega-6 in the form of linoleic acid has, however, been challenged. In other words, it could be the Omega-3 which is responsible for the benefit. However, we have multiple studies showing that higher circulating levels of Omega-6 (which correlate well with dietary intake) reduces risk of cardiovascular disease and possibly all-cause mortality. At most, all of this would imply caution about Omega-6 PUFAs. The RCT evidence decreases my confidence in them somewhat, the evidence pertaining to dietary intake is inconclusive, and the evidence from circulating Omega-6 supports their benefits. If you’re worried about them, it might be prudent to have a low intake of Omega-6 PUFAs (though whole foods such as nuts and seeds are fine) and saturated fats, and a high intake of monounsaturated fats and plant and/or marine sources of Omega-3 PUFAs: canola oil, flaxseed oil, nuts, seeds and oily fish. In other words, all the foods that I listed in any case. Olive oil is low in Omega-6 polyunsaturates and saturated fats (and high in monounsaturated fats), as is canola oil (which is also high in monounsaturates and Omega-3 polyunsaturates) and flaxseed oil (which is high in Omega-3). Nuts and seeds tend to be low in Omega-6 polyunsaturates, or at least high in either monounsaturates or Omega-3. Oily fish, of course, is high in Omega-3. I didn’t cite the RCTs of the Mediterranean Diet to make a point about saturated fat, just to demonstrate that it’s an extremely well-studied dietary pattern with impressive results, both in RCTs and prospective cohort studies. Coincidentally or not, it is low in saturated fat and Omega-6, and high in monounsaturated fat and plant and marine sources of Omega-3. Thanks for your response, in particular for explaining why you included the trials you did in your discussion. I certainly agree with you that there’s no downside to consuming a diet low in both omega-6 PUFA and saturated fats, with high intake of monounsaturated fats and omega-3 PUFA. For context, I also think we’re in agreement (you can correct me if I’m wrong) that it’s ideal to eat a low amount of red meat, a high amount of seafood (including oily fish), and whole-food sources of monounsaturated fats like avocados and (certain — see below) tree nuts. Obviously all of these factors affect dietary fat composition (and suffice to make over half of dietary fat unsaturated regardless of what added fats are used). So I think our only disagreement is about added fats — in particular, whether vegetable oils are better than saturated animal fats (your position); or whether there is no strong reason to prefer one of saturated animal fats or monounsaturated vegetable oils over the other, but that both are preferable to polyunsaturated vegetable oils (my position). By the way, tree nuts differ wildly in their omega-6 polyunsaturated fat content — for example, macadamia nuts are about 2% omega-6 polyunsaturated, while pine nuts are about 50%. If tree nuts are the single biggest source of fat in your diet (as they are in mine), you can substantially reduce your omega-6 polyunsaturated fat intake by choosing lower omega-6 tree nuts. (2) After I originally read through the human RCTs some years ago, my first impulse was to cook with the specially-bred “high-oleic” oils, which are the most highly-monounsaturated vegetable oils available on the market (comparable omega-6 polyunsaturated fat content to saturated animal fats — i.e. about one third the omega-6 polyunsaturated fat content of olive oil — and also quite low in saturated fat). This lasted until I requested information from the manufacturer of the “high-oleic” oil I had been purchasing, which revealed it was labeled as high-oleic by mistake (so contained an order of magnitude more omega-6 polyunsaturated fat than I thought). Only then did I start cooking primarily with saturated animal fats, and using olive oil — from California, which has the tightest quality controls for this kind of thing — for variety. I would agree that our only source of disagreement is about added fats. I probably do put somewhat less weight on the RCTs than you do. It would be great to have a well-conducted RCT examining this question in the future, though it probably wouldn’t get past an ethics committee. I do also give some weight to the views of medical authorities, such as the American Heart Association and the Harvard School of Public Health, who are generally positive about Omega-6 PUFAs. I’m quite uncertain, though, about Omega-6 PUFAs in general: perhaps I am putting too little weight on the RCTs. Perhaps I wouldn’t even prefer them to sources of saturated fats. I’ve not tended to think about this specific question very often because I’ve naturally used MUFA-rich and Omega-3 rich sources of food and fat anyway. Aside from my belief that MUFAs are better than saturated fats, sources of MUFAs tend to have other benefits (i.e. seeds such as almonds having other beneficial nutrients, extra virgin olive oil having polyphenols and canola oil having Omega-3s). Because I’m not concerned about total fat, but rather the proportions of each type of fat in the diet, I’m not even too concerned about the Omega-6 or saturated fat content of olive oil, canola oil or nuts and seeds, as long as they don’t make up the majority of the fat alone or put together, as they do with the pine nut example you mentioned. That’s my case for why I’m not too worried about high-oleic varieties despite the corresponding increase in Omega-6 and/or saturated fat in low(er) oleic varieites: some nuts and seeds, as well as olive and canola oil, are already high in oleic acid and/or alpha-linolenic acid in terms of proportion. It’s nice to be in a place where we only disagree about added fats, and even then about whether the olive oil should be used for everything or just for variety as you put it! Yes, it’s a very interesting place, as are all of the Blue Zones that Dan Buettner and National Geographic have identified – the places where people live the longest with the lowest rates of chronic disease too. Diet, as you note, is only one factor, though it’s certainly a prominent one. They also have rich social lives, the elderly are respected for their wisdom instead of being seen as a burden, and people in these places move naturally, getting a lot of physical activity under their belts every day without even thinking about it. Isn’t the whole point behind sugar being more culpable in obesity, is that it activates different metabolic pathways and thus eating behaviour? In other words, calorie for calorie, I eat fat I metabolise it one way such that I’m satiated. I eat a source of sugar, at a hormonal level my pancreas kicks in to store all the glucose in cells, ghrelin and leptin are knocked out of whack, end result being me being compelled to eat more sugar which is plentiful in modern society. I can literally drink the stuff on a whim? What am I missing? Are fat and sugar metabolised the same way? Does that matter? Having said that, although both low-fat and low-carbohydrate diets produce weight loss in randomized control trials in general, low-carb diets do tend to have the advantage. It’s unlikely to be due to satiety, because people on the diets often consume similar amounts of calories (which suggests that there’s no satiating effect going on) yet the low-carb dieters still tend to lose slightly more weight. There’s mixed evidence on whether different macronutrients lead to different satiety, but the ones which do find positive results tend to find that protein is the most satiating, followed by carbs, followed by fats. If so, this may explain why there’s no satiating effect observed: people on low-carb diets eat more fat which is less satiating but also more protein which is more satiating, and these balance out. Lower calories in explains the weight loss that can be achieved on almost any diet, but higher calories out may explain the remaining weight loss that’s achieved in addition on low-carb diets, which are actually high-protein diets. Also, low-carb dieters tend to lose a lot of water weight initially, which may explain part of the weight loss. As far as I’m aware, it doesn’t explain all of the weight loss. A fairly consistent finding, meanwhile, is that adherence to any diet is low. The Mediterranean Diet probably has the best adherence in the literature, because it doesn’t restrict whole macronutrient categories, but rather emphasizes protein, fat and carbohydrate quality. No scientific study to back it up, but I’m pretty confident that the problem with sugar is that sugary foods make it much easier to over-consume calories. If I’m absolutely stuffed from eating burgers and fries, I can still find room for a piece of cake or a bottle of Coca Cola. To make matters worse, intensely sweet foods seem to have a tolerance effect. If you drink Coke regularly, fruit seems a lot less sweet. To reconcile the metabolic ward studies which show that caloric balance is the key with the very strongly observed correlation between sugar consumption and obesity all one has to do is accept that excess consumption of high GI foods has an effect on metabolic rates or behavior. The former effect is more difficult to prove but the latter effect, that high GI foods affect behavior is pretty well documented. As a simple demonstration of this, one day for breakfast have 500 cal of lean chicken breast, the next day 500 cal of steak, and the next day 500 cal of sugary cereal and juice. See how soon you get hungry after each meal. Most people will get hungry far sooner after the third meal than the first two. As far as I can tell, the literature is clear that varying the glycemic index of ones diet has a pretty strong effect on cravings and calories consumed. Therefore, caloric balance is still correct but the anti-sugar people are correct that reducing sugar consumption can be key for fighting obesity. As far as the diet of the Hadza people, does Guyenet account for the vastly different caloric needs of the African hunter gatherer lifestyle vs American keyboard warrior lifestyle? If not, that’s a huge, gaping hole in the argument. What’s the current view on set points? Pretty well established, interesting but more work to be done before we can be sure, controversial, or quackery? And is there any useful practical advice from the theory? Is there a definition of metabolic ward studies? I couldn’t find a definition of metabolic ward studies on wikipedia, but for anyone else wondering, what I got from some web searches was that either the subjects are kept in a metabolic ward so they can only eat what the researchers provide, or they’re allowed to leave the ward and roam the hospital which risks them using the cafeteria. Medical professionals and nutrition experts seem to be converging on food and dietary patterns being more useful to talk about that specific nutrients. A Mediterranean-style diet rich in fruits, vegetables, whole-grains, healthy plant proteins (legumes/beans), and monounsaturated and polyunsaturated fats found in olive/canola/flaxseed oil, nuts, seeds and oily fish is what most experts endorse. Low in added sugar, refined carbohydrates, meat/dairy/saturated fat. For beverages: water, tea, coffee, small amounts of alcohol. Walter Willett, a Professor of Medicine at Harvard and head of the nutrition department at their School of Public Health, probably answers your question more thoroughly here. Does anyone know of any counter evidence for the energy density hypothesis? This claims that we regulate via food volume, and so as caloric density has increased we’ve correspondingly gotten fatter. I can think of ways to test this, but I haven’t been able to find much in the way of existing research. I have wondered about this. We’ve several millennia of agriculture under our belts, we’ve bred crops and livestock to what we want and to improve yields. Comparing the wild grains and berries our hunter-gatherer ancestors ate with the foods we’ve produced since surely must mean a huge difference in caloric density. A population that has always lived with sugar is not a counterexample. A counterexample would have to be a population exactly like the other ones that were recently introduced to sugar but didn’t develop obesity, diabetes, etc. like they did. Groups of people that survive on high-sugar diets logically will have genetic and gut microbiome adaptations to their diet, and may as well be a different species for all the relevance they have to the populations we’re concerned about. Compare with lactose intolerance, which exists heavily in groups that lacked milk in their diet two hundred years ago, but is pretty much absent in populations where milk was regularly consumed. Adaptations to local diets are as common as adverse reactions to foreign diets. They would, however, be a counterexample if you introduced them to a western diet and they subsequently developed obesity, diabetes, etc. at the same rates as everybody else. That would actually be very strong evidence that sugar wasn’t the culprit…unless it was only refined white sugar that’s a problem, which this group doesn’t seem to have access to.